Yesterday, Houses of the Hockey ran a nice little post titled History Will Be Made Pretty Much Every Day - and they're right. Thanks to the NHL calling game winning goals in Game Three "history will be made" worthy, these commercials are losing their effect. This is a sad development, because the ones from last year were so good they could leave you with goosebumps. The success from last year, and the hundreds of parodies created by fans was special, and left you wanting more. Unfortunately, we're left with too much now, but there still has been some great commercials from this year. 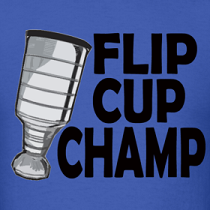 The above is an instant classic, and captures the new found history of those teams from their back-to-back Stanley Cup Final appearances. What's your favourite History Will Be Made? Here's a nice one for Toronto Maple Leafs fans who may not have seen the goal, but definitely know the story of Bob Baun scoring the overtime game winning goal on a broken leg in Game Six of 1964 Stanley Cup Finals against the Red Wings. 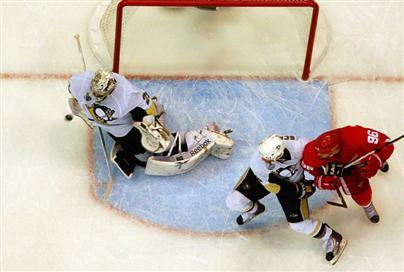 As a Pens fan, that MA Fleury save is my favorite. That diving stop will be part of my memory for the rest of my life!